Pamela Sullivan recalls her feisty mom. A celebratory mood reigned at NSRI Melkbosstrand this past Saturday morning. The morning was dedicated to the blessing of two boats, Brenda’s Spirit and Rotary’s Gift. Brenda’s Spirit is awash with Kleinze Zalze Brut. Apart from being a great spirit Brenda was also the author of Spirit of the Rocks and Africa: Through the Mists of Time. 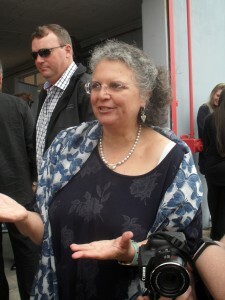 She was also a friend of the famous Zulu author and sangoma Credo Mutwa. 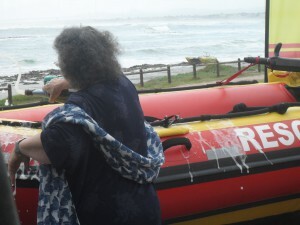 She donated two boats to the NSRI, as well as a cottage in McGregor which can be used by the NSRI’s volunteer members. Having had the mystery explained and a prayer said by pastor Mike Channing, the crowd watched as Brenda and Bridget Wares from the Rotary Club in Table Bay blessed the boats with bottles of Kleine Zalze Brut. “Smells woody,” said someone, perhaps a tad enviously.